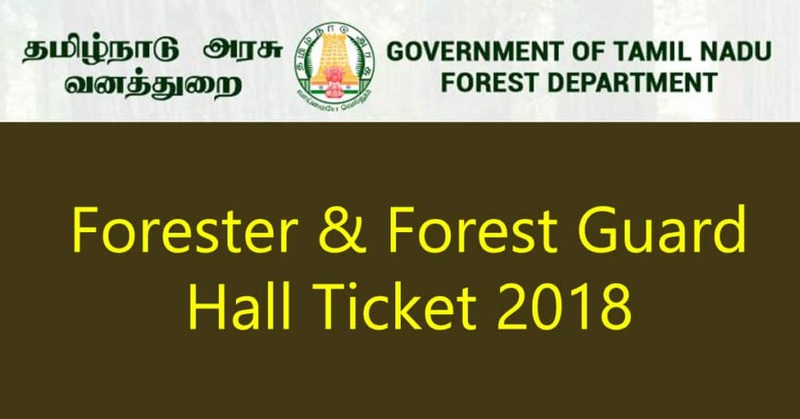 TN Forest Guard hall ticket 2018 – Tamilnadu Forest guard hall ticket will be released on 02.12.2018. The examination has scheduled from 06.12.2018 to 11.12.2018. Here you can find details on TN Forester Admit card, Tamilnadu Forest department call letter, TNFUSRC exam details, TN Forest exam time table, TN Forest guard exam hall ticket. Tamilnadu Forest is going to conduct examination for Forester and Forest Guard vacancies. The candidates who are all applied for the examination can able to download the TNFUSRC Forester and Forest guard admit card from https://www.forests.tn.gov.in. The candidates need to carry the Tamilnadu forest exam hall ticket at the time of the examination. So the candidates need to take more attention to the examination. Here below you can find mock test link for TN Forest guard and Forester examination. This is will be very much useful for the examination. Due to this, you can get some clear idea about the exam. Tamilnadu Forester exam time table is released. The candidates who are all applied for the examination can able to download TN Forester Timetable below. Tamilnadu Forest Guard exam time table is released. The candidates who are all applied for the examination can able to download TN Forest Guard Timetable below.